They came by the millions! Some arrived on overcrowded trains carrying five times their normal capacity. Some came by bus, by car, some by ox drawn carts, and others rode on horses, camels, and even elephants. The rich and famous chartered private planes and helicopters, while the less affluent came on foot carrying their bed rolls and camping equipment in heavy bundles on their heads. Wave after wave, they formed a veritable river of humanity that flowed onto the banks of the Ganges at Allahabad to celebrate the greatest spiritual festival ever held in the history of the world, the Kumbha Mela. Kumbha Mela has gained international fame as "the world's most massive act of faith." 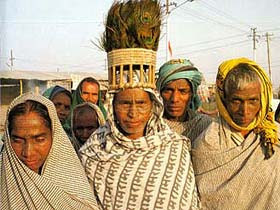 Pilgrims come to this holy event with such tremendous faith and in such overwhelming numbers that it boggles the mind. Faith is the most important thing for the pilgrims at Kumbha Mela, they have an "unflinching trust in something sublime". To understand the significance of the Kumbha Mela and the important role that it plays in the spirituality of India, it is helpful to know something about the background of the sacred Ganges River. The devout believe that simply by bathing in the Ganges one is freed from their past sins (karma), and thus one becomes eligible for liberation from the cycle of birth and death. Of course it is said that a pure lifestyle is also required after taking bath, otherwise one will again be burdened by karmic reactions .The pilgrims come from all walks of life, traveling long distances and tolerating many physical discomforts, such as sleeping in the open air in near freezing weather. They undergo these difficulties just to receive the benefit of taking a bath in the sacred river at Kumbha Mela. This spectacle of faith has for many centuries attracted the curiosity of foreign travelers. Hiuen Tsiang of China, who lived during the seventh century, was the first to mention Kumbha Mela in his diary. He gave an eyewitness report that during the Hindu month of Magha (January-February) half a million people had gathered on the banks of the Ganges at Allahabad to observe a celebration for 75 days. The pilgrims, writes Hiuen Tsiang, assembled along with their king, his ministers, scholars, philosophers, and sages. He also reports that the king had distributed enormous quantities of gold, silver, and jewels in charity for the purpose of acquiring good merit and thus assuring his place in heaven. 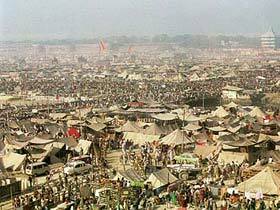 In the eight century, Shankara, a prominent Indian saint, popularized the Kumbha Mela among the common people, and soon the attendance began to grow to enormous proportions. 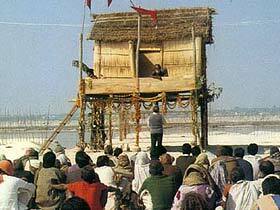 Shankara placed special importance to the opportunity of associating with saintly persons while at Kumbha Mela. Both hearing from sadhus (holy men) and sacred bathing are still the two main focus at Kumbha Mela. 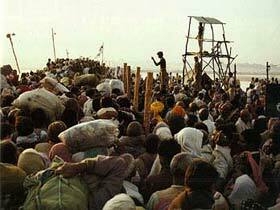 By 1977, the number of pilgrims attending Kumbha Mela had to risen to 15 million! By 1989, the attendance was in the range of 29 million-nearly double that of the previous record. Photographer David Osborn and I contributed to this year's record participation by spending seven austere weeks living in a tent on the banks of the Ganges, observing the Kumbha Mela with wonder and admiration. The ancient origin of the Kumbha Mela is described in the time honored Vedic literatures of India as having evolved from bygone days of the universe when the demigods and the demons produced the nectar of immortality. The sages of old have related this story thus: once upon a time, the demigods and demons assembled together on the shore of the milk ocean which lies in a certain region of the cosmos. The demigods and demons desired to churn the ocean to produce the nectar of immortality, and agreed to share it afterwards. The Mandara Mountain was used as a churning rod, and Vasuki, the king of serpents, became the rope for churning. With the demigods at Vasuki's tail and the demons at his head, they churned the ocean for a 1,000 years. A pot of nectar was eventually produced, and both the demigods and demons became anxious. The demigods, being fearful of what would happen if the demons drank their share of the nectar of immortality, stole away the pot and hid it in four places on the Earth: Prayag (Allahabad) Hardwar, Ujjain, and Nasik. At each of the hiding places a drop of immortal nectar spilled from the pot and landed on the earth. These four places are believed to have acquired mystical power, and festivals are regularly held at each, Allahabad being the largest and most important. 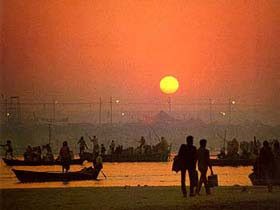 Besides the Ganges, there are also two other sacred rivers located at Allahabad, the Yamuna and the Saraswati . The Yamuna, like the Ganges has its earthly origin in the Himalayas. 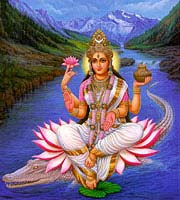 The Saraswati, however, is a mystical river which has no physical form. Its is believed that the Saraswati exists only on the ethereal or spiritual plane and is not visible to the human eye. This holy river is mentioned many times in India's sacred texts such as the Mahabharata and is said to be present at Allahabad where it joins the Yamuna and the Ganges. This confluence of India's three most sacred rivers at Allahabad is called the sangam. The combined sanctity of the three holy rivers, coupled with the spiritual powers obtained from the pot of nectar of immortality, has earned Allahabad the rank of tirtharaja, the king of holy places. 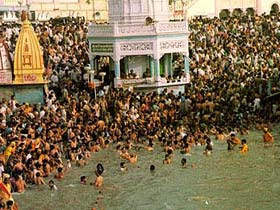 The main highlight for most pilgrims during a Kumbha Mela is the observance of a sacred bath at the sangam. It is said that a bath in either of the sacred rivers has purifying effects, but where the three rivers meet, the bather's purification is increased one hundred times. Furthermore, it is said that when one takes a bath at the sangam during the Kumbha Mela, the influence is one thousand times increased. During Makar Sankranti , Kumbha Mela began with all the pomp and glory for which it is famous. The temperature dropped to 35 degrees Fahrenheit on the evening of the 13th, but bathers were not to be discouraged. Just past midnight, thousands began to enter the confluence of the three rivers, immersing themselves in the icy cold water. Loud chanting of "Bolo Ganga Mai ki jai (all glory to Mother Ganga)" filled the clear night air as the pilgrims washed away their bad karma. They came away from the bathing area wrapped in blankets and shivering from the cold. But as quickly as they came out of the water, thousands more came in their wake. With continual chants of " Bolo Ganga Mai ki jai" they entered the waters. At dawn the sky reddened and the sun rose to reveal a crowd of five million enthusiasts slowly advancing towards the sangam. From the center of that mass of humanity came a marvelous procession announcing the official beginning of the Kumbha Mela. Bands played, people danced in jubilation, and colorful flags and banners flew above the crowd. 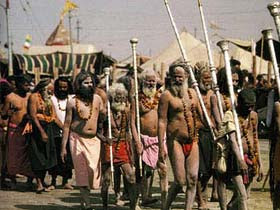 At the head of the procession were the nagas, India's famed naked holy men. These holy men engage themselves in renunciation of the world in search of equilibrium. They hope to escape the world's concomitant reactions and suffering by their austere practices such as complete celibacy and non-accumulation of material possessions. Thus they are known as liberationists. With matted locks of hair, their bodies covered in ashes, and their tridents ( the symbol of a follower of Shiva) raised high, they descended upon the bathing area. Entering the water in a tumult, blowing conchshells and singing " Shiva ki jai, Ganga ki jai," they splashed the sacred waters upon each other and played just like children. Indeed, they are said to be the very children of the Ganges. Next came the Vaisnava vairagis, the wandering mendicants who dedicate everything to Visnu, the Sustainer. These saints live a life of service and complete dedication.Then came the innumerable other sects of ascetics dressed in saffron colored cloth and carrying their staffs of renunciation. All the centuries gone by of India's spiritual evolution were simultaneously there together in the procession. Each in turn bathed in the sangam. Several hours passed before the procession had finished. Then began the mass bathing of the pilgrims. From the high banks of the river one could see the dark blue water of the Yamuna mixing with the silver gray water of the Ganges. Bathers, immersed up to the waist, scooped up water with folded palms and offered it to heaven in a timeless gesture. 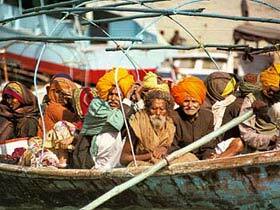 Boatmen rowed their boats full of pilgrims to a small sandbar in the middle of the sangam which soon disappeared under a cloud of bathers. There was none to young or old for this occasion. A young mother sprinkled a few drops of the rivers' water over the head of her newborn baby, asking God to bless her child with a good life and prosperity. In another place an elderly couple eased themselves into the cold water. Some bathers made offerings of flowers, sweets, and colored dyes to the sacred waters, while others offered Vedic hymns. The chanting of OM - the supreme combination of letters - and Sanskrit mantras issued from the lips of every pilgrim. As night fell, thousands of campfires could be seen burning along the riverbanks. In the central festival area, gaily decorated pandals (large tents) accommodated the thousands who listened to some of India's most exalted gurus lecturing on spiritual and philosophical topics. In some pandals there were Indian drama and classical dance groups whose exotic costumes and performances attracted large audiences. In other pandals there were elaborate displays and dioramas illustrating the stories from India's ancient epics like the Ramayana and Mahabharata. There was so much to see and do that there was never a dull moment. Some pilgrims prefer to come to the Kumbha Mela on the days of the big sacred baths like Makar Sankranti and then return home, while others prefer to set up camp and stay for the duration. This year at Kumbha Mela there was six scheduled days for important baths. Those who remained for the full 41 days of the festival and observe all the important baths are called kalpvasis. 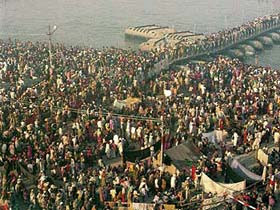 Indian government spent more than 8 million dollars on preliminary organization for the Kumbha Mela. According to national newspaper reports, arrangements provided 5,000 gallons of purified drinking water every minute;8,000 buses which shuttle pilgrims in and out of the festival area that spread over 3,00- acres; 16,000 outlets and 6,000 poles which provided electrical facilities; 6,000 sweepers and sanitation employees who worked around the clock to maintain health standards; 9 pontoon bridges which spanned the Ganges at intervals; 20,000 policemen, firemen, and the Indian National Guard who kept a constant vigil at checkpoints and with closed circuit TV guarded against traffic congestion and other possible outbreaks or disturbances; and 100 doctors and nurses on call at all times at medical assistance stations. An entire city sprang up along the banks of the river during the Kumbha Mela complete with markets, hospitals, and even a tourist camp to accommodate visitors from foreign countries. The tourist camp informed me that they had sheltered over 1,000 visitors from abroad during the festivities, most being from Europe and South America. Some of these visitors from abroad had never been to India before. Others seemed as well acquainted with what was happening as did the Indians. In the market areas all the required necessities and luxuries of Kumbha Mela were for sale. In one place fruits and fresh vegetables were available. In another place wool blankets, which sold briskly, were piled in big stacks for easy selection. Along the main thoroughfares gypsies spread their wares which included different shapes and sizes of brass pots and bowls, beads for meditation, exotic perfumes, incense like kastori(musk) and chandan (sandalwood), and even tiger's claws set in gold. It was also interesting to note that all the food arrangements throughout the festival were vegetarian. There was not a trace f meant, fish or eggs to be found in any camp or in any public eating place. We learned that meat is strictly taboo amongst all types of transcendentalists in India. For the novelty seekers there was also a wide selection of oddities in the market. For a rupee or two one could employ a snake charmer who, when playing on his pungi (snake charmer's flute) would make the cobras dance, swaying to and fro. 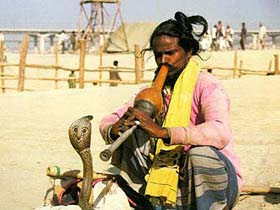 It is a long standing belief that the cobra is charmed by the sound of the pungi. Having observed several of these performances , however, it was our conclusion that the snake charmer charms his audience rather than the snake. Many palm readers and mystic soothsayers set up shop along the Ganges offering passers-by a look into the future. Astrology and palmistry are traditional sciences in India, but one could not help but think that some of these "mystics" were simply out to turn a fast rupee from a gullible public. No doubt that among the sincere and authentic spiritualists at Kumbha Mela there were also the cheaters and hence the cheated. Buyer beware. The camel, a hardy beast of burden, used in India for centuries to transport cargo long distances and through difficult terrain, was the unsung hero of Kumbha Mela. Carrying heavy loads of firewood, tents, and foodstuffs on their raised backs these awkward creatures formed the very lifeline to the Kumbha Mela residents. In the soft sand, cars, trucks, and even horse carts often got stuck. But the camel was rugged and the goods always got through. For everyone at Kumbha Mela, early mornings were the most austere time of day because it was always colder than at any other time. However, chilly sunrise is considered the most auspicious time of the day for spiritual practices.Every day at dawn , thousands arose early to bathe in the Ganges and return to their camps to change mantras and meditate. At the northern end of the festival grounds, cast against the stil blue sky, stood a lone grass hut built upon sturdy stilts. This was the ashrama of Devara Baba who, according to his followers, is more than 200 years old. Devara Baba is a lifelong vegetarian and celibate yogi. His admirers believe that his exceptional longevity is due to the fact that he only drinks and bathes in the Ganges, whose waters are considered very sacred.When we asked Devara Baba about his exact age, he replied, " I have lost count of the years. It has been a very long time." Every morning and evening tens of thousands of pilgrims walked the two mile stretch along the Ganges to the ashrama of Devara Baba with the hope that they might get a glimpse of this ancient sage. Much to their delight Devara Baba was always willing and even happy to accommodate them. Sitting on the veranda of his simple raised hut, the old sage relaxed in the warm rays of sunlight and blessed his visitors. Sometimes smiling or raising his hand in a gesture of grace Devara Baba radiated the aura of peacefulness. Some pilgrims brought offerings of fruits and flowers, while others came only with their prayers for blessings. It was our prayer to the sage that he allow us to take a few photographs, and in his usual gracious manner he consented. As prominent as Devara Baba was, we sensed that there were many great souls who went undetected in our midst. We photographed until we ran out of film and were left only with a feeling of helplessness. 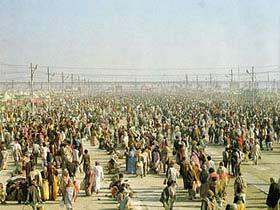 Kumbha Mela was indeed a magnificent and awesome encounter.It was impossible to capture the festival. Indeed, it was the festival that captured us. Words, film, print, and paper can not do justice to the event — it is one that has to be experienced personally.